Under the gaze of President Karzai, a lazy morning at the Khan's winter house. The Kyrgyz are notoriously fractious and independent-minded. They don't often rally around a leader. A Kyrgyz joke goes that if you put three people in a yurt and come back an hour later, you'll find five Khans. They respect President Karzai's authority but hold little hope that the central government can help them improving their living conditions...At the Qyzyl Qorum camp. It is the camp of the now deceased Khan (Abdul Rashid Khan, died in December 2009), and headed by the self proclaimed young Haji Roshan Khan (his son). Opium addicted Haji Roshan was never officially stated Khan and is therefore not accepted as leader by the entire Kyrgyz community. 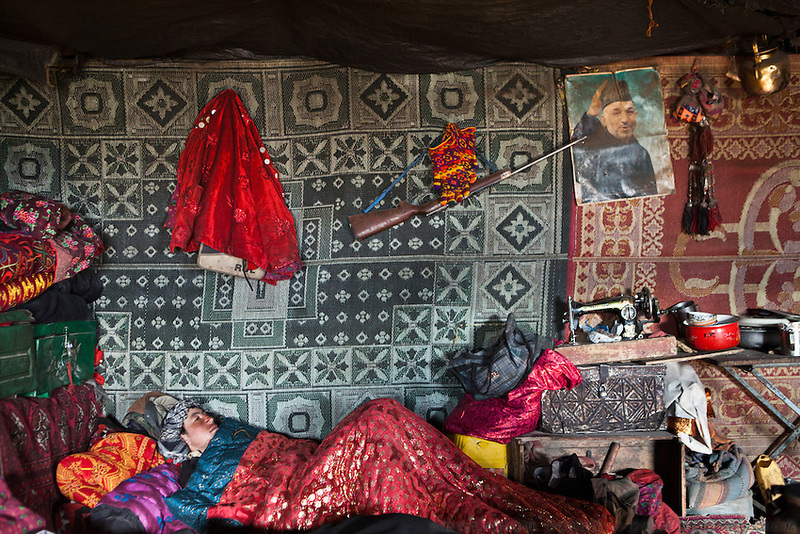 Near the Afghan-China border..Pirum Verde (from Ech Keli) is sleeping late...Trekking through the high altitude plateau of the Little Pamir mountains, where the Afghan Kyrgyz community live all year, on the borders of China, Tajikistan and Pakistan.